100% Carfax certified, non smoker! Super cool and mean looking FJ with oversized all terrain tires on custom Fuel wheels, LED lights on top in the custom grill, and rear bumper light the road around you no matter how dark it gets, Rhino lined roof, door handles and mirrors help add to the custom look. Clean interior without tears and wear! She drives as good as she looks! 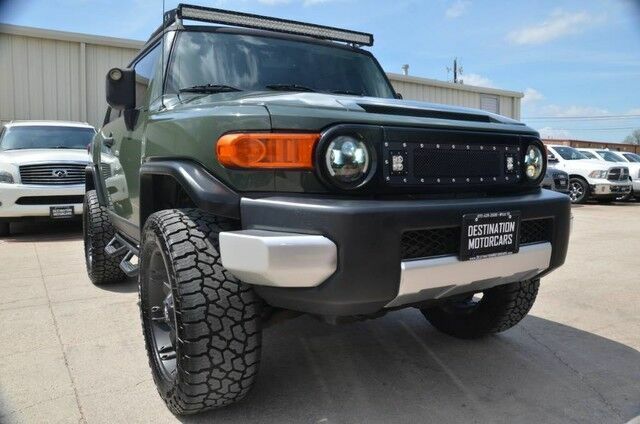 Be sure to visit www.destinationmotorcars.com to view all 59 pictures of this FJ Cruiser! IMPORTANT NOTE ABOUT OUR PICTURES We truly strive to provide pictures that are accurate examples of the vehicle you are seeing. We go to great lengths to take a large amount of pictures of the inside and outside of the vehicle. A great deal of our customers come from great distances and from all over the country we do our best to make sure the vehicle you see in these pictures is EXACTLY the vehicle you will see in person when you visit or have your vehicle delivered to your home. We do not edit or alter the raw image in any way. If you would like additional details or photos you can certainly reach out to us at your convenience and we will be happy to accommodate you! We aren't like other dealers we strive to create a fun, exciting, no pressure environment we don't have big overhead expenses so we can pass along the savings to you. We study the market and price our cars at a great value upfront to skip the hassle and uncomfortable negotiation process. The price you see is the price you pay! Call us today to see why you'll always want to buy your cars from us from now on! 972-429-3500, call today and lets set a time to meet!